“Legend of the Jade Hairpin《玉簪記》” was written by Gao Lian around 1570 AD, toward the end of the Ming dynasty. The play consists of 33 acts. 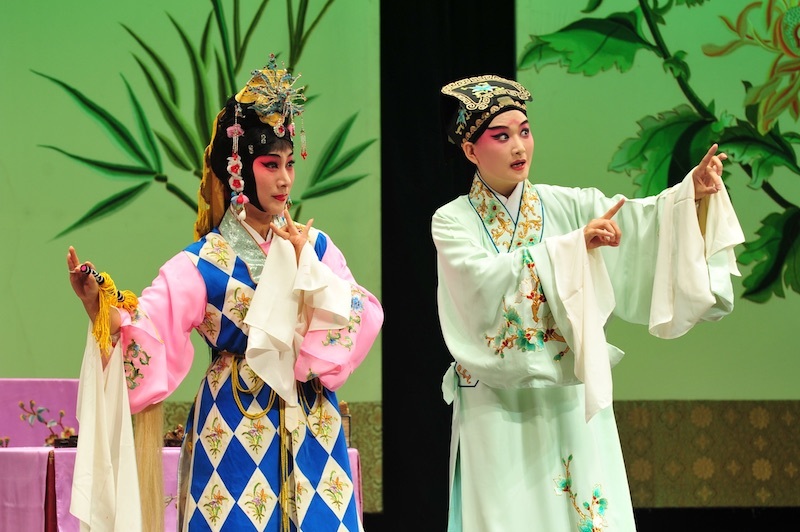 It is an example of a genre called chuan qi, meaning “fantastic”, that was popular during the sixteenth century. The story occurs in the Southern Sung Dynasty (1127 – 1279 AD). Pan Bizheng, a young scholar, was engaged to Chen Jiao-Lian by their parents while still in their childhood. Later, the families lost contact while fleeing from foreign invasion. After the death of her father, Chen sought asylum in a Taoist monastery and became a novice there with a Taoist name Meao-Chang. Unbeknownst to her, the Monastery was managed by Pan’s aunt. Pan Be-Zhen is studying to become a Government official. He traveled to the capital city to take the national civil service examination. Having failed the examination, he was too embarrassed to return home. Instead, he lodged in his Aunt’s Monastery to study for the next examination. There Pan and Chen met for the first time. Without knowledge of their marriage engagement, they fell in love almost at first sight. When he encounters Meao-Chang again, Pan expresses his feeling by playing a love song with a zither. She is moved but nevertheless rejects his pursue for her being a nun. Pan misses her so much that he becomes ill. Meao-Chang comes with his aunt to comfort him while he was ill. She expresses concern but remains uncommitted. A few days later, Pan visits Meao-Chang in return. He discovers, by chance, her poem describing her hidden love toward him. This leaves Meao-Chang no way to hide her love anymore but committed to him. Upon learning about how they feel about each other, Pan’s Aunt becomes enraged. She forces Pan to leave for the capital city immediately to take the examination again. Pan and Chen are heart-broken. She runs after him with a small boat to say farewell to him. Finally, Pan succeeds in the examination and became a Mandarin. Now his father considers him to be eligible for marriage, and reveal to him his childhood engagement. He then realizes that his beloved was actually his official fiancé. Pan and Chen are finally reunited in happy matrimony.